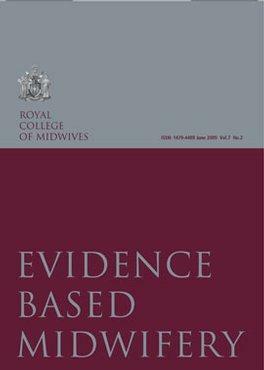 Evidence Based Midwifery (EBM) is a standalone quarterly journal, which aims to promote the distribution, implementation and evaluation of midwifery evidence locally, nationally and internationally. The journal publishes papers that report findings from qualitative or quantitative research studies, philosophical analyses and systematic reviews. It is a 36-page, double-blind peer-reviewed journal with a national and international editorial panel. Panel members were appointed on their academic, professional or subject expertise. Reviewers are invaluable and the editors seek to ensure that each article submitted is reviewed by at least one expert in the subject area and where possible an expert reviewer on the method. This high-profile journal is essential reading for all research midwives, academics, students and professionals wanting to familiarise themselves with the latest cutting-edge midwifery research. Be the first person to tell us what you think about Evidence Based Midwifery (EBM) and you'll save £2.50 on your next purchase!